The circuit & switching logic is posted on another page so you can park this page and the logic page and shuttle between the two for quick reference. CLICK HERE to open the Circuit and Switching Logic page. I was quite surprised to find such a sophisticaed circuit in these Kawai / Teisco guitars. I've not seen any similar sophistication except in Nate Daniel's Danelectron Dane guitars. A link to circuit and switching logic is now provided further below. Pots and caps values are not visible with the electronics harness intact; And this original harness and parts will not be disturbed to retrieve those values. If desired or needed; CLICK HERE to open a separate page in a separate window, of info and diagrams about the switches and pots functions for playing the guitar. You can shuffle between the pages for references to each page. This is NOT the technical Circuit & Switching Logic link. If desired or needed; CLICK HERE to open a separate page in a separate window, of TECHNICAL Circuit and Switching Logic info and diagrams about the switches and pots functions. You can shuffle between the pages for references to each page. This IS the technical Circuit & Switching Logic link. Check out the pickup selector rocker switches that have no function whatsoever in the ON positions ! All pickup function switching is from the OFF position circuit contacts ! The Rythm position of the Rythm / Solo rocker does not simply switch on a filter capacitor; And although a filter capacitor is used in the Rythm circuit, the Rythm circuit also gangs other pickups in decreased volume amounts depending upon the positions of each pickup selector switch. 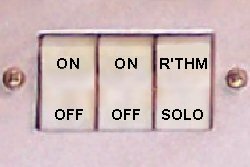 Switching to 'Solo' simply removes the 'Rythm' circuit from the scheme. This is remarkably similar to the genius of Nate Daniels in his Danelectro Dane series guitars (which took me and a couple other electronics techs a couple of weeks brain-storming together to finally figure it out ! ). Ground solders here are actually one central solder point on the bottom center of the mounting bracket plate, and not on each end as illustrated here for convenience.